How many exercise machines have failed you? One? Two? Dozens? Your story is just like thousands of others who are disappointed in their exercise equipment and just wish they could finally tone down and sculpt their abs, thighs, and obliques. Now you can do it the smart way with the Smart Crunch™ from Body by Jake®, the complete abs plus back workout machine that as fun and easy to use as it is effective. The secret to the Smart Crunch is in its patented dual smart pivot design that keeps your body in motion throughout the entire exercise. Just sit on the soft, padded seat, grab the handles, and rock your way to perfect abs and obliques with four great exercises - in just 4 quick minutes a day. The Body by Jake Smart Crunch is perfect for everyone from beginners to pros so you'll never get too strong for the machine. Constructed of lightweight yet strong tensile steel, the Smart Crunch easily folds away for storage - but once you try it, you won't want to stop using it! Start each workout routine in the forward position to work your upper abs and obliques, then switch to the cross crunch for love-handle burning action. Drop those ugly pounds with the lower abs workout and finally tone your entire midsection with the big crunch at the end. The Smart Crunch relieves tension and stress in your back as the firm back rest rolls up and down your back with each rocking motion. Plus, it's adjustable for anyone from 4'10" to 6'5" and up to 300 pounds. 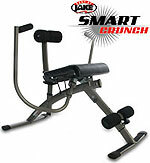 Use the links below to find the best offer of Body By Jake® Smart Cruch™.